You never forget your first time on the wings of Angels. My first time experiencing Tony Kushner’s earth-shaking epic Angels in America was 1994 in an American Conservatory Theater production with Mark Wing Davey directing. I saw each part of this massive work – Part One: Millennium Approaches and Part Two: Perestroika – several weeks apart and then saw the marathon weekend double feature (both plays in one day) twice before the end of that five-times-extended run. I felt at the time like it was the smartest play I’d ever attempted to understand (but could still never fully comprehend), the most rewarding drama and comedy I’d ever seen and the most staggering work of art I could imagine a human (Kushner) and a team of supporting artists (the cast and crew) ever creating in my lifetime. I mean, here was a play dealing with recent American history (the AIDS epidemic, the Reagan years, Russia, Roy Cohn) where five of the main characters are gay men and one of them is a prophet. Kushner is mixing politics, domestic drama, hilarious one-liners, sweeping cultural change, the ancestors, all of history (or so it seems) and the machinations of heaven and hell in nearly eight hours of theater that goes by more quickly than some 90-minute one-acts I’ve seen. That’s how I felt then. Almost 25 years later, I feel exactly the same way but more. MORE. 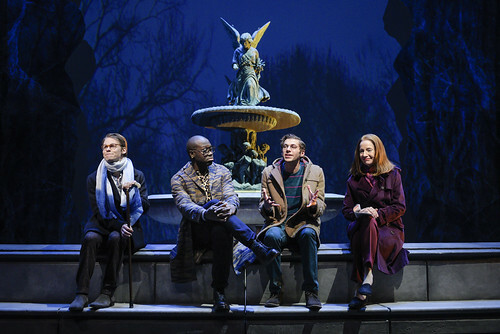 Angels in America is back in the Bay Area, this time at Berkeley Repertory Theatre, where it is directed by Tony Taccone, who, with Oskar Eustis helped bring this play into the world when it premiered at their Eureka Theatre in 1991. The play’s staggering genius is on full display in Taccone’s marvelous production, as is Kushner’s prescience (Russia, Republican politics, the environmental crisis). In a bold and admirable move, Taccone’s production had its official opening on a Saturday and featured parts one and two. That means a theater experience that lasts from 1pm until 11pm (with a generous couple of hours for dinner break) – and what an extraordinary experience. We’re so used to having someplace to be that surrendering to 10 hours of a singular event is like sanctuary. Then to have that sanctuary filled with Kushner’s intense intellect and dramatic and comic acumen is to spend 10 hours that will renew your faith in theater as an essential life element: air, food, water, drama. When you return to something you love after an absence, there’s always a chance you’ll find something diminished or something that doesn’t match the inflated ideal that has lived in your head for decades. But coming back to Angels in this assured and sleekly designed production finds nothing diminished but rather deeper, more moving and even more mysterious. Kushner’s audacity in harnessing characters from the real world (Cohn, Ethel Rosenberg), fictional characters you might find in any play or sitcom (estranged lovers, testy in-laws, rock-solid best friends, distant husbands, frustrated wives) and then mixing in the mythic (angels!) and the apocryphal (God did exist but he has disappeared!) is unmatched in modern drama. And though the plays cover, essentially, a period from 1985 to 1986, they don’t feel dated in any way that makes them seem less vital or imaginative or visceral. The stage of the Roda Theatre has been turned into a giant marble vault by designer Takeshi Kata. Bits of scenery slide on and off the stage, while Jennifer Schriever’s lights train focus and set mood with startling efficiency. The lack of fancy stagecraft means we’re paying more attention to the words and the performances, though the occasionally spectacular video projections (by Alexander V. Nichols) bring some spectacle, as do the wizards at Flying by Foy who pull the strings of the angel’s flight. If the audience can really hear Kushner’s words, I’d say that 90 percent of the work is done. The script is that good as characters veer from the prosaic to the poetic to the prophetic, sometimes within one speech. The basic rule is this: get out of the way of the play and let it roll. That rule is respected here. It’s astonishing at the curtain call(s) to see that there are only eight actors in these plays, though several pull yeoman’s duty in multiple parts. Spending this much time with actors tends to make you fall a little in love with them. There are three performers in particular who had me in their thrall. Carmen Roman begins each play in the guise of an old man (a rabbi in Part One, the world’s oldest living Bolshevik in Part Two), and she is the kind of actor who makes every word sing with truth. She also plays a beleaguered doctor (imagine having to tell Roy Cohn he’s dying from AIDS), the ghost of Ethel Rosenberg and a tough but devoted Mormon mother. She is spectacular in every role, as is Francesca Faridany as the imperious angel, a compassionate nurse, a Salt Lake City Realtor, a homeless woman in the Bronx and a diorama dummy come to life. Twenty-seven years ago, Stephen Spinella originated the role of Prior Walter, the play’s protagonist. He went on to win two Tony Awards (one for each play) and then to a career on Broadway and on screen. He’s back on stage in Angels but this time in a very different role. He’s playing the nightmare known as Roy Cohn, and he is ferociously good. He’s dangerously charismatic and funny and just as dangerously full of fight and venom. To watch his scenes with Roman as Ethel Rosenberg is to feel a most curious (and soul satisfying) twist in karmic retribution. As Prior Walter, Randy Harrison finds his own ferocity and warmth, especially in his scenes with his best friend Belize, the quick-witted nurse (played by Caldwell Tidicue, probably better known as Bob the Drag Queen, the Season 8 winner of RuPaul’s Drag Rqce). Several hours’ worth of angst is supplied by Benjamin T. Ismail as Louis, Prior’s erstwhile boyfriend and speed talker. Louis doesn’t leave any ideas unexpressed, no matter how ill-formed or potentially offensive, and that makes for good theater. As the Mormon couple in a seismically shifting marriage, Bethany Jillard as Harper and Danny Binstock show how painful the rough, splintered edges are as they poke through the thin veneer of everything as it’s supposed to be. 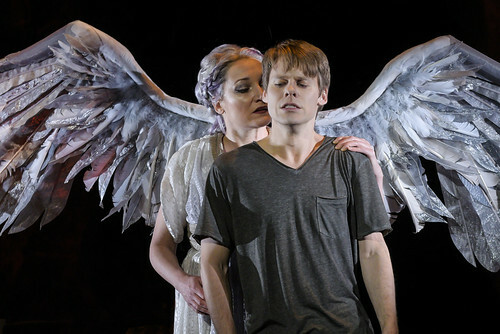 Tony Kushner’s Angels in America: Millennium Approaches and Perestroika continue through July 22 at Berkeley Repertory Theatre’s Roda Theatre, 2015 Addison St., Berkeley. Tickets are $40-$100. Call 51-647-2949 or visit www.berkeleyrep.org.